The sky was perfect today. The air was still and crisp cold as a line of clouds hung lonely in the sky. When I got home I had a limited amount of time to fashion a very basic table from ancient bits of wood I found lying in the woodshed. It is held together by a few screws and no structural cross struts at all. It is crude but it is enough to hold up the recycling bins and give the cats a cosy sheltered spot underneath them. This means that the greenhouse bench has been freed from its recycling duties and is now ready for trays of seeds in the, now gutted and cleaned, greenhouse. When my time pottering in the garage was up I returned to the cottage and picked up the little man for some quality father and son time as the lovely Sharon taught her piano lessons. For a while he was in his carrier attached to my chest. Wrapped up and donned with his woolly ‘toot’ hat (it says toot on it and has a little car as well) we ventured into the garden to see what spring was doing with itself. We stood under the bare trees and looked up through the branches. We looked into some of the bird boxes and wondered if anything was cosy inside. We looked at the buds starting to untwist and unfurl from the blackcurrant bushes. We stood and looked at the greenhouse, empty of plants but filled with anticipation. Then when we felt we had relaxed into the evening he suddenly became quite distressed. For the next half hour he was inconsolable and only calmed down for a moment after the littlest of burps. When he eventually felt better, tiredness began to creep up on him. He tried his best to smile and be happy but he could not beat the fatigue. A lovely thought that is a romantic one until that child has stomach pains, this is when the child only knows cuddles and tears. The lovely Sharon lost her composure a couple of days ago. She sat down and calculated our electricity bill, she was inconsolable for hours. Moving into a different house gives rise to unknown quantities. 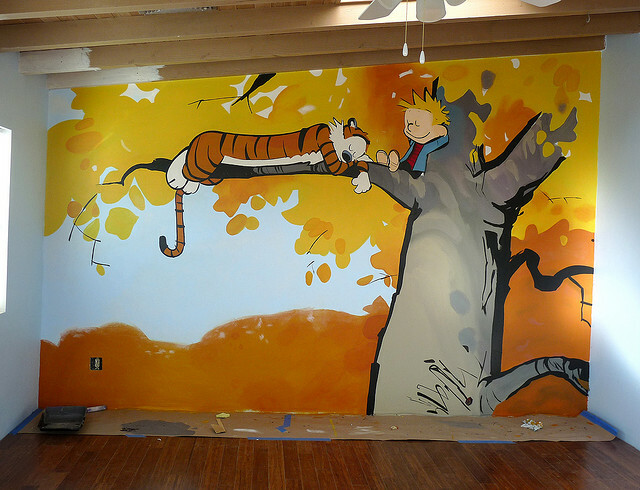 Will the new house be breezy? Will it hold in the heat or leak it out from every undetectable hole? It turned out that we used more oil to heat the cottage than we used in our old house, but we were pleasantly surprised that we did not use as much oil as we thought we would in ‘the coldest December in Ireland since records began’. The electricity if a different matter entirely. The truth is that we picked up a tumble drier just before the little man arrived into the world. The fact that he arrived in the winter and that he needs a ridiculous amount of clean clothes every day means that the dryer has been on daily. 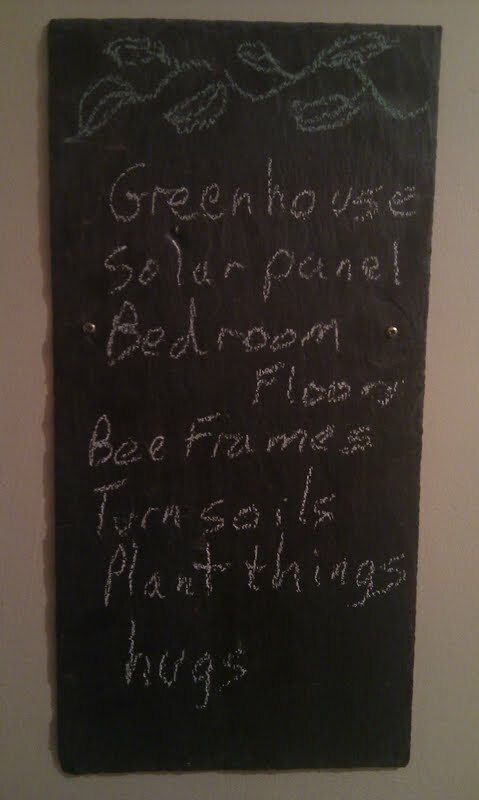 The lovely Sharon wanted to know what we could do to reduce our electrical wattage. I made two suggestions which I thought were sensible. The first was that as the warmer weather was on its way, we could use the clothes line more often. She was a step ahead of me here and had already started down this path. The other suggestion was that the power consumption was related to her being on extended holiday maternity leave and that her kettle habit was happening more than it would when she was at work. When pushed for clarification, I pointed out that she does boil a full kettle then leave it for a few minutes then boil it again, then leave it and boil it again, before making a cup of tea. This observation did not sit well with her and apparently I should refrain from taking to her until I have something more constructive to say. This morning, with our electrical consumption fresh in my mind, I dusted off a solar panel from the old house. I calculate that if I was to connect it to the mains somehow, we would reduce our electricity bill by 0.00001%. Instead I connected it to an old computer fan and it now serves as air circulation in the greenhouse. It used to be part of a greenhouse heat sink that warmed the under floor stones during the day. 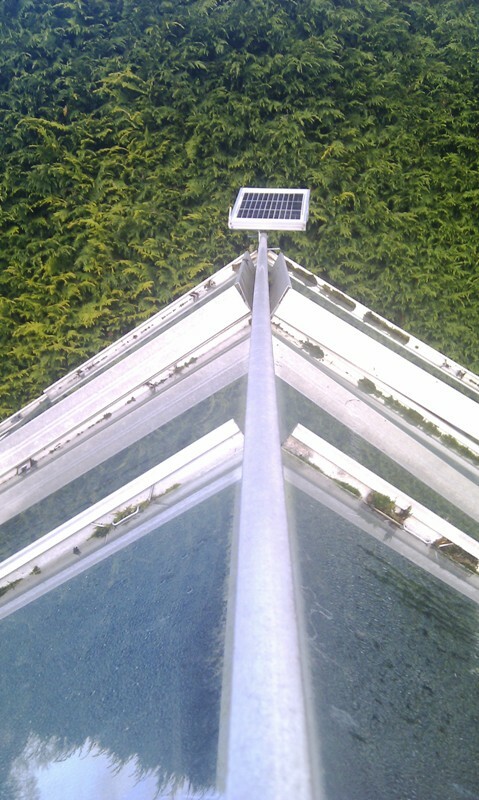 However, in this greenhouse it cannot have such a geeky job as I have no time for it. Another accounting problem came to the forefront of our minds today; eggs. Having 28 eggs a week means that we end up giving a lot of them away to friends and family. 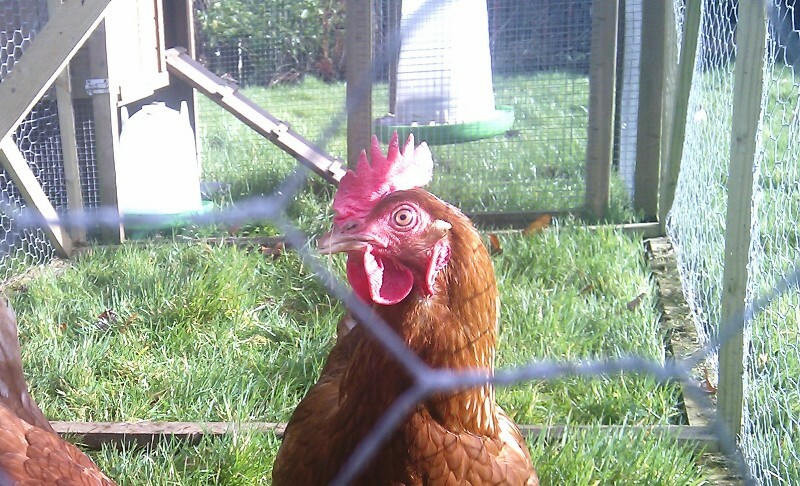 This is part of the enjoyment of having the chickens but we should have been more mean. With family coming for dinner tomorrow we need the eggs for desserts, pastries and our own weekend traditional pancakes. We are refusing to buy extra in the shops. Every egg is a precious item at the moment with a predestined job before it has even been layed. is slow food supposed to be made so frantically? This evening I spent some time with the power-hose. We have been spending a lot of time together lately; stripping off the winter dirt from the yard, patio, lane, driveway and, tonight, the greenhouse. Nearly an entire compost bin was filled with the desiccated contends of the greenhouse and it should now be ready to start some things growing if we can get round to it. After cleaning the greenhouse I had to make a cheesecake. 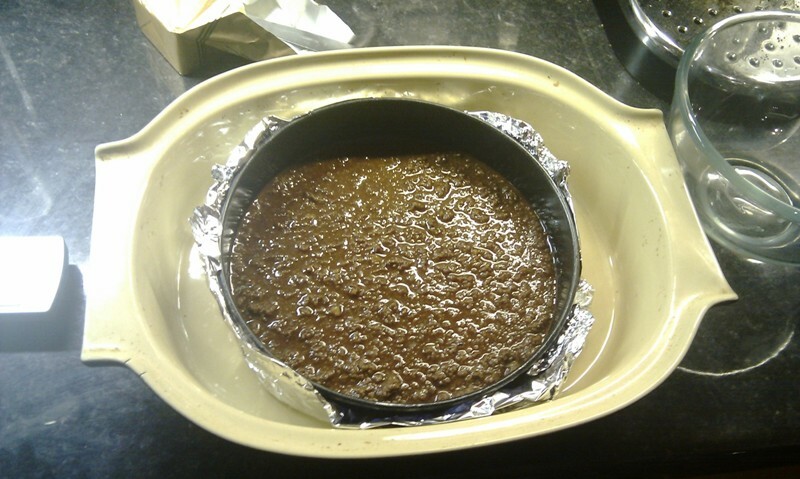 I recently discovered that one of my form class is winning prizes for her sticky toffee pudding. Maybe I want to build her confidence while uniting and bonding with my form class, or maybe I want to put her in her place. Either way, tomorrow is the ‘Battle of the Desserts’. She will bring in her apparently prize winning pudding and I will grace my form classes’ presence with the fabled chocolate cheesecake. May the best cheesecake win! It had to be made this evening, that itself was not a problem. The problem was that I had also started a bread mix as soon as I walked in the door as the current loaf is down to its last. This all sounds very busy but the truth is that I enjoy making these things. I enjoy the process and playing about with the mixes. I enjoy the taste of the final product, not because it is home made, it is because I made it. It is pride. However, I must admit that it sometimes goes quite wrong. I never usually share the wrong products, it is much too embarrassing. First a big pile of chocolate digestive biscuits (150g) are smashed to within an inch of their lives before it is mixed with a big blob of melted butter (100g). 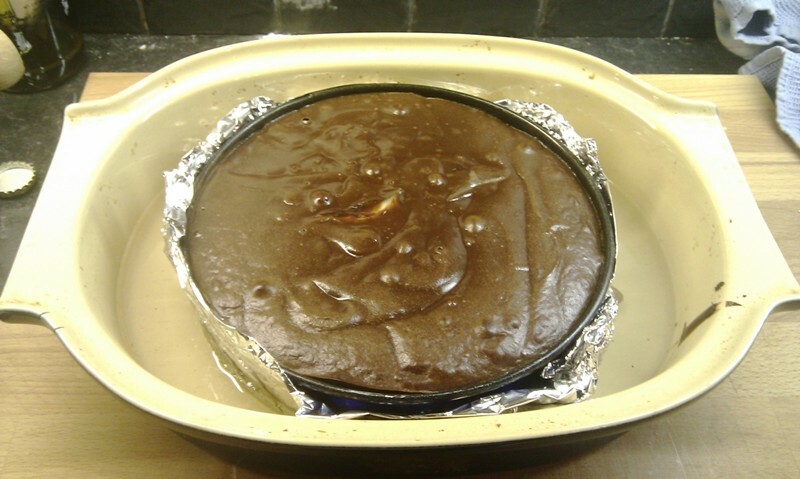 This gooey mix is placed in a cake tin which has been smeared with butter. 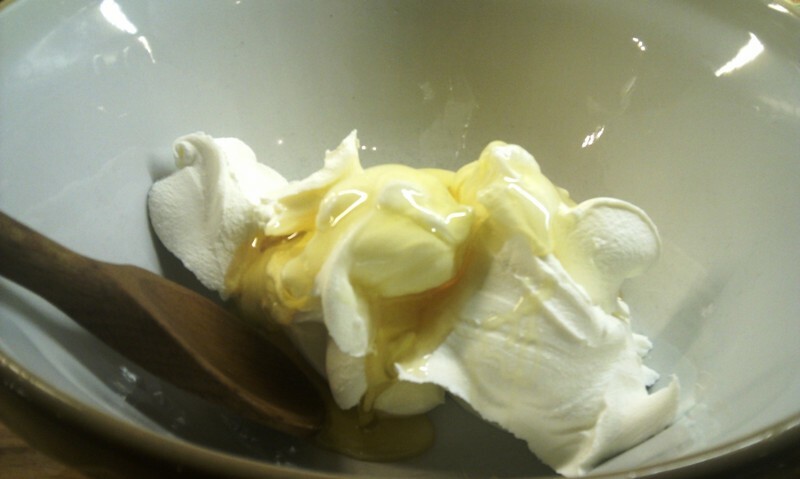 Two tubs of mascarpone cheese are mixed with a Goldilocks amount of honey. If you use too much honey you will be able to tell when the final cheesecake tastes too sweet. If you use too little honey you will be able to tell when the final cheesecake tastes not sweet enough. Then an egg is mixed in. Then another egg. Then an egg yolk. Then another egg yolk. Then a teaspoon of vanilla essence is mixed in. Meanwhile, two massive bars of very dark chocolate should be melted. 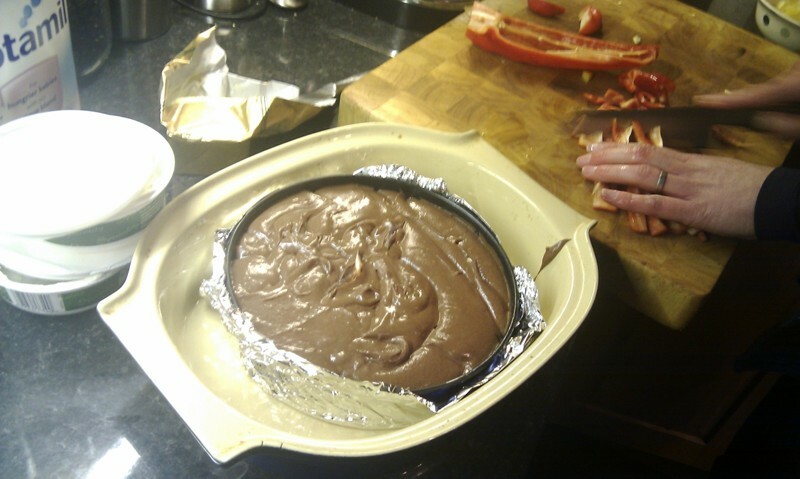 Once the chocolate is melted it can be mixed with the cheesecake mix and then poured over the chocolate biscuit base. 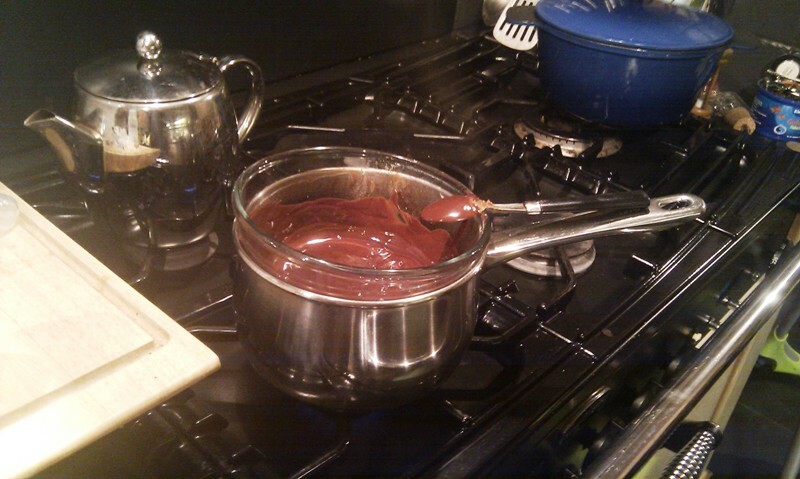 The tin foil is used so that boiling water can be poured around the cake without mixing with it. This helps with even cooking and prevents burning around the edges. The whole thing can then be placed in a 160 degree oven for 40 minutes. This takes a little more timing than the cheesecake. 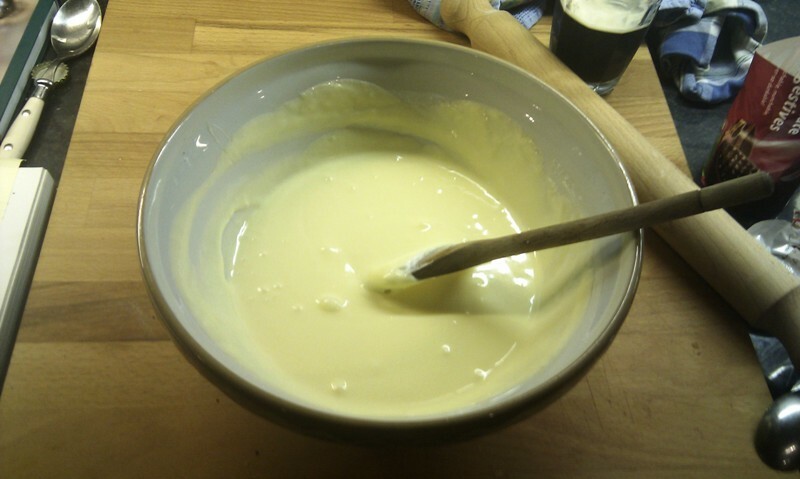 I start by mixing 500g of strong white flour with 600ml of water and 10g of yeast (or a 7g packet is fine too). I usually leave this for a few hours. This step is not essential and can be skipped, but I find it adds more flavour. 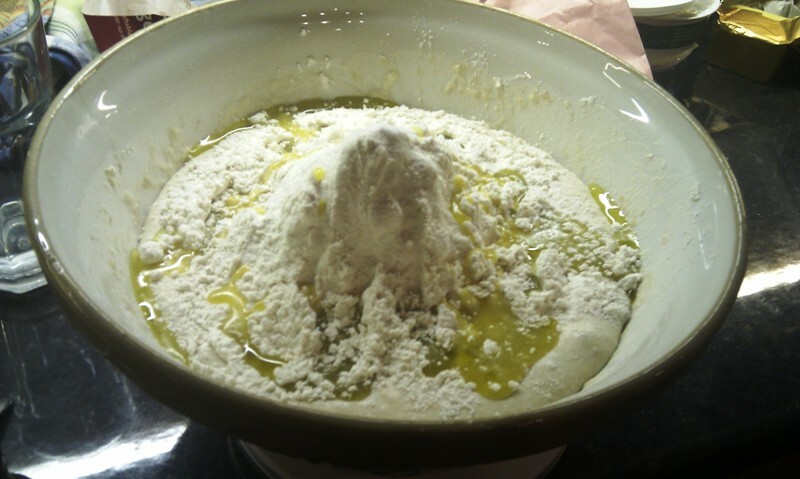 Then I add another 500g of strong white flour and 10g of salt (don’t forget the salt!) and also a few generous squirts of olive oil. 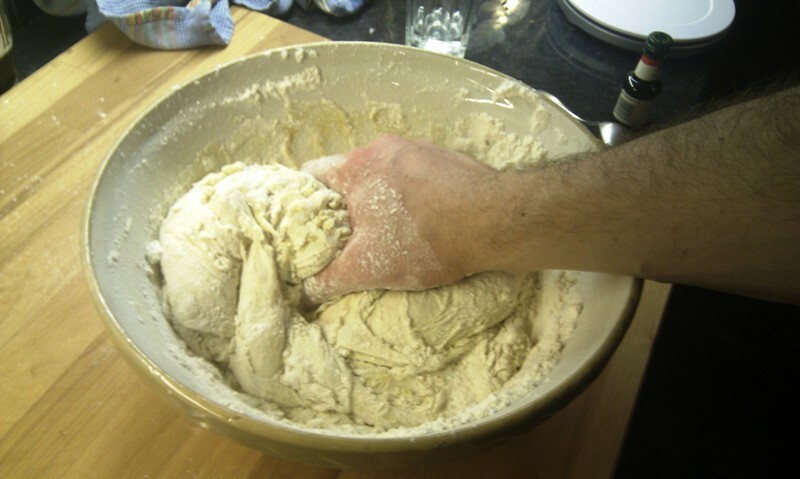 This is then mixed well and kneaded. 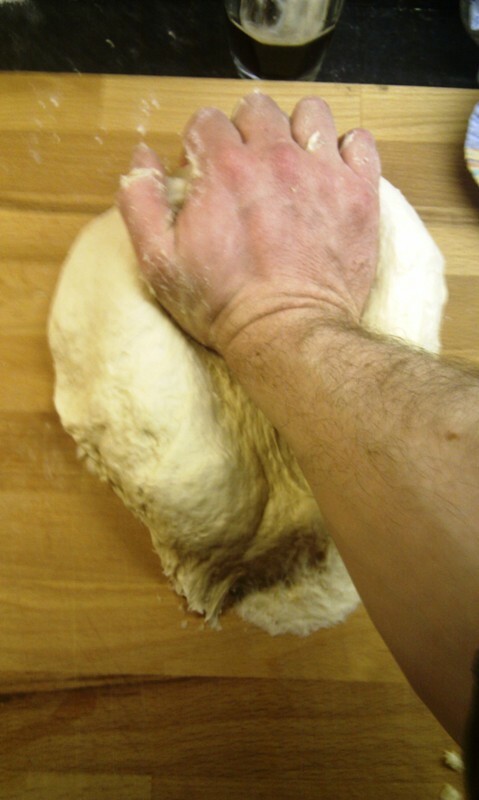 Kneading involves really working your hands into the dough for about 7minutes. Arms and hands do get sore. 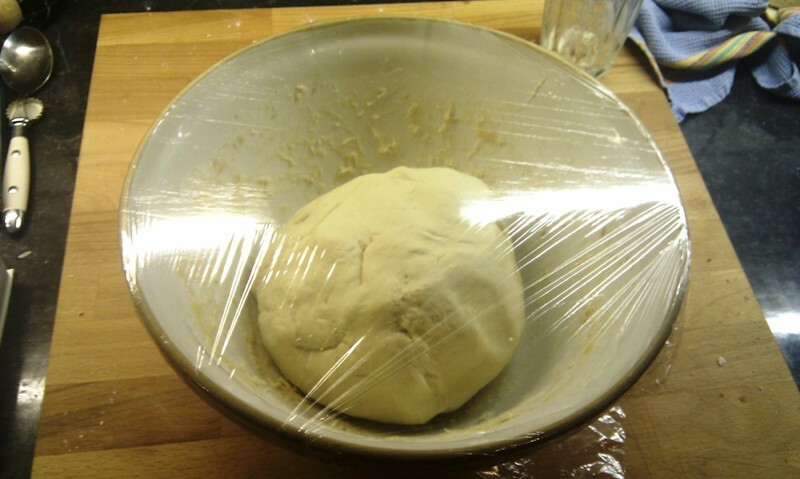 Then I put cling film over the bowl and leave the dough in the hot press for 2 hours so it can have a good think about itself. 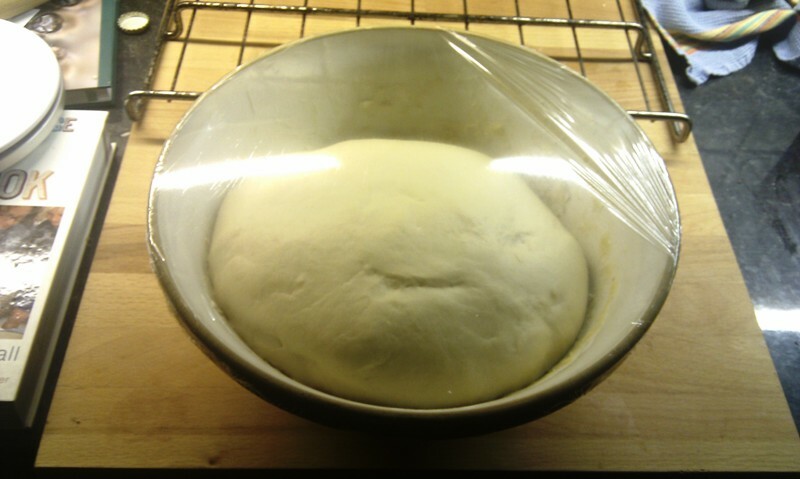 After 2 hours the dough has usually increased in size a bit. 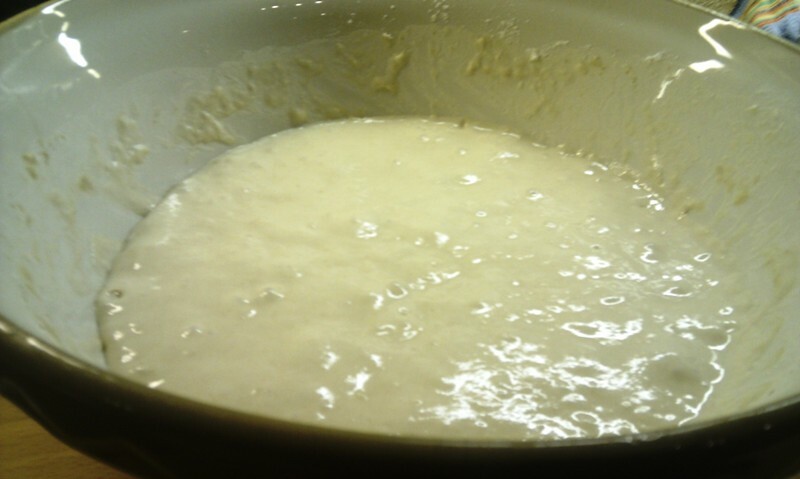 The dough is gently removed and divided in two. In this process it will deflate and reduce back down. 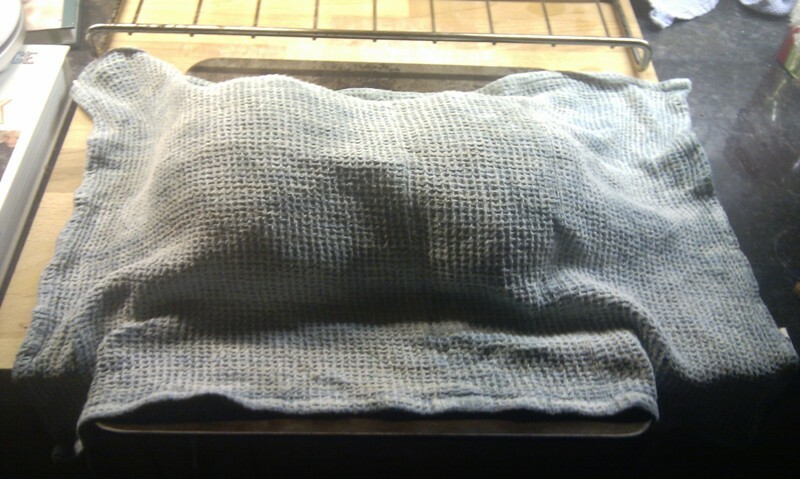 The two ‘loaves’ are placed on an oven tray and covered with a damp tea towel. This allows them to expand some more. I usually put the oven on to its maximum temperature at this stage. 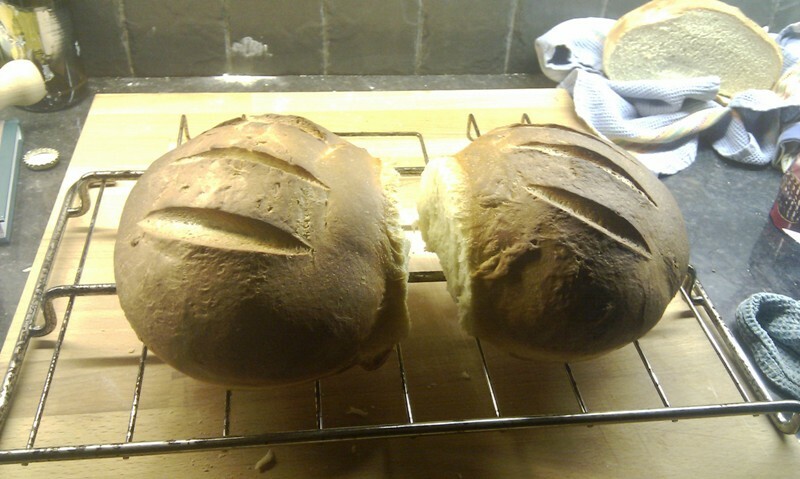 After about half an hour I put them in the oven. I usually have a tray at the bottom of the oven with a bit of boiling water in it too. They go into the oven (with a few slices with sharp knife) for about 20 minutes. The lovely Sharon and I cannot resist having a slice with butter when it is ready. Even if it is bed time when it is ready and we are stuffed from a big dinner, we will still guiltily have a slice or two. The lovely Sharon would also like to contribute a recipe for today. She should include her chilli con carne but apparently it is a secret. Instead she would like to share her recipe for hungry boy milk. 270ml of freshly boiled water is placed into a sterilised bottle. 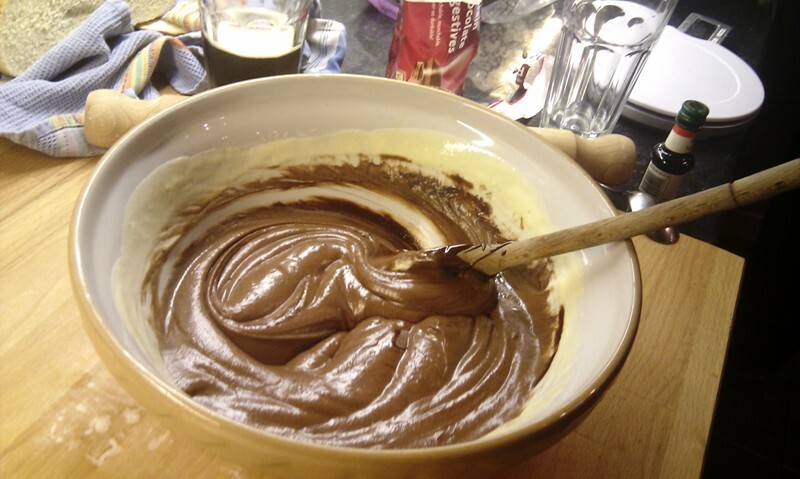 Then 9 level spoons of ‘hungry milk’ powder is added. Mix and allow to cool to a luke warm temperature before serving. It must be good as I have seen a certain person I shall not mention look frantically for said milk and then cry uncontrollably until the milk is served. Tonight I closed the gates. This is a nightly ritual here at the cottage and is a ritual that I have not been allowed to partake in, in quite a while. The lovely Sharon insists that she closes the gates. She actually does not insist but merely sulks if I suggest that I could close them. What closing the gates actually means is a dander around the cottage, a chat with the cats and some scratching under the chin is administered as they are assured, in comforting whispers, that there will be plenty of birds and mice to try and catch tomorrow. Then the dander continues down the lane and finally the gates are leisurely closed. Wellies, woolly hat and a thick buffalo ensure that this is enjoyable in all weathers. Apparently the lovely Sharon needs the fresh air as her day is a busy one spent frantically chatting to all sorts of people in coffee shops and such things. As opposed to my day where I get to enjoy massive amounts of fresh air and the outdoor world walking from the school car park to the school building, and I get to do this twice! I can’t really complain at all (but it is fun) as I walk around the cottage every night anyway. I have to feed and water the chickens and sometimes move the coop to a fresh patch of grass. But tonight I got to close the gates as well as the lovely Sharon had her fill of fresh air today. Today she went for a jog around a park. She did this while pushing the little man around in his pram. While reasonably acceptable in London and New York, it is quite a strange thing to do here in Northern Ireland. Especially when it is a busy park and a small park. Forty minutes of jogging meant that she had to do many laps and meet the same people over and over again. She says that with most of them the ice was broken after the third or forth lap. From then on she seemed to get to meet the whole park in short bursts of conversation. There was even some drama in the form of the little man’s pram losing a wheel mid jog. Those of you who know the lovely Sharon will not be surprised. There is a logical explanation; a wheel must always be removed to fit the pram into a car that can only be classified as ridiculously tiny. When the wheel was not refitted properly it simply careered off mid jog and the drama unfolded. A couple ran frantically to assist and the lovely Sharon simply re-fitted the wheel then jogged on in a very girly way. As I finished the closing of the gates tonight I caught the slate at the back door and I made a fresh mental notes of the things that are needing attention. It seems that when I wrote it I left the most important chore to the last. Tonight the little man, the lovely Sharon and I, all sat down together for tickles. He already smiles nearly all the time and he has laughed for a while now, but tonight he was laughing out loud and uncontrollable with all that he could find in him. This was all after we had a visit from our own parents. And tonight I am thinking of being parents and our own parents. The lovely Sharon’s parents are often frustrated when they impart wisdom to her that they have already told her when she was younger. They sigh and she has only a vague memory of it. So, what is the point of sharing wisdom, and experiences, to our children (I mean in the general sense of children as I have only one) before they can appreciate it? There is a point, and I was reminded of it tonight as I watched A History of Ancient Britain. I was watching episode two and it took me from the Mesolithic to the Neolithic. These two styles of living clashed as the hunters tried to make their mark on the land when the farmers were beginning to creep in. They built massive standing stones row upon row. These are intimidating and awe inspiring structures at Carnac in the north of France. I always feel drawn to old standing stones, we even drove past one today and I got the lovely Sharon to slow down a little for me to press my face to the window and stare. As the presenter of the TV program walked through the stones I had a little echo of thought; I have been there, I have walked through the stones at Carnac. Many years ago my parents took my sister and I to France on holiday and Carnac was just one of many halcyon days. I have a vague recollection of the stones but another memory of that day overrides the stones. A memory of beautiful chocolate covered crepes. And so I remember the fickle stomach driven emotions and not the awe inspiring venue. Until now, years later I appreciate it more. I have stood there and felt the stones on my hands. 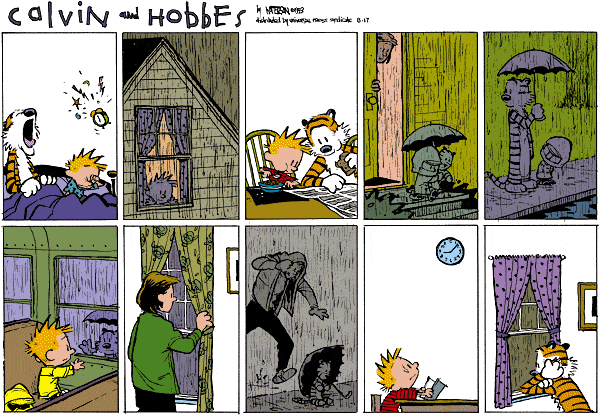 It may take years, but it all sinks in given enough time.